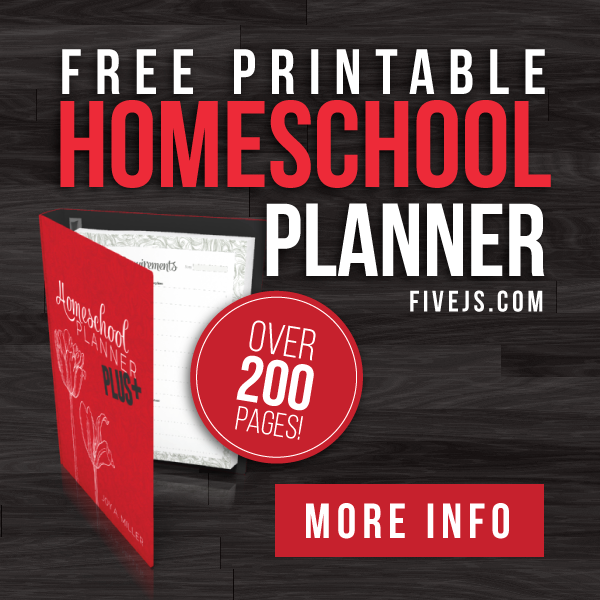 Today I'm starting a new series here on FiveJs.com that will highlight home businesses run by homeschooling families. I'm extremely excited about this series for so many reasons! I know there are many families who want to homeschool their children but just can't seem to see how they'll make it work financially. I'm hoping that through these interviews with families who run home business, these discouraged families might be encouraged—and maybe even inspired to start their own business. I'm also hoping that the businesses these families run might be strengthened by being introduced even more to the homeschool community. 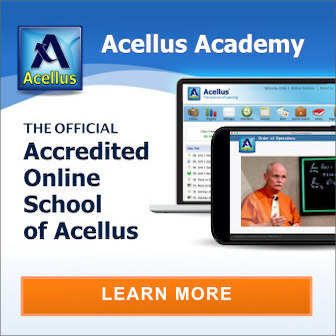 I know homeschoolers love supporting other homeschoolers, and this is another way we can do just that. 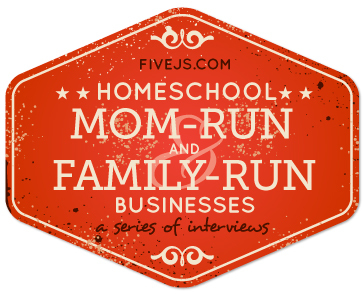 Within a few weeks I will also be launching a Homeschool Family-Run Business directory here on FiveJs.com that will include the business of the families who are interviewed in this series. In future, if you have a need and you'd like to see if there's a homeschool family that can meet that need, I hope you'll visit the business directory. So without further ado, I'd like to present our first interview. I was born and raised in Northern California, not far from where we currently live. We live a few hours north of the Bay Area but we're in a very rural area where we enjoy the advantages of having farms and a dairy near us to provide us with farm fresh eggs, fresh produce, and milk. My parents are Dutch immigrants and I married an MK (missionary kid) who was raised in France, so our combined backgrounds have allowed us to "think outside the box," and that's come in quite handy with our business ventures. 2. Tell us a little about your family. 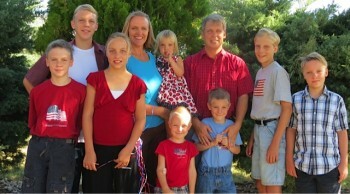 We have eight children, ages 2 to 14 (6 boys, 2 girls, including a set of twins). We've always homeschooled. My husband's degree is in economics and had worked in the computer tech field for 12 years before switching to helping me run MadeOn from home, and also now starting his own home business. 3. Tell us about your business. MadeOn is a skin care company that makes and sells a unique lotion specifically for dry skin. The products are all handcrafted at my home and sold over the internet. We use few ingredients (shea butter, beeswax and coconut oil) and no fillers, and that is part of our unique selling point. 4. How did you start this business? Officially, the business started in 2009, although I consider that first year a year of "research and development." 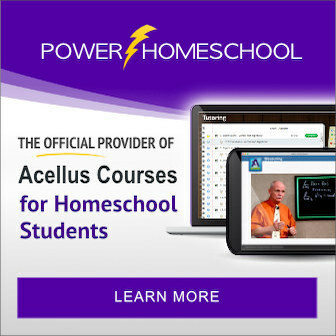 I had three focus groups of homeschool moms and chef school students who tested my products and gave me feedback via an online survey I created. Most of the reviewers I had never met before. I made and sold products at our local farmer's markets to be able to see how people reacted to it, figure out the price point, get my "pitch" across, and decide if it was something worth continuing. I loved doing the farmer's markets although looking back, I realize it was a lot of work to prepare for it (including getting myself and my older boys up at 6 a.m. on Saturday mornings through the winter to set up and sell for a few hours.) Every dollar I made went right back into building the business that first year… except for the dollars that treated the family to ice cream or went toward tamales, cheese and produce from my fellow market vendors. 5. What led to the creation of your business? I wasn't looking for a business to start, although I always thought it would be a fun thing to do. It really started when I found a solution to a problem that I had had for years. My fingers would crack and bleed due to dryness, and it affected my day-to-day mom responsibilities. Right before I discovered the hard lotion bar recipe, I had also thrown myself into baking bread for the family, but my fingers and knuckles would crack and bleed, and that made baking very difficult to do. I had also begun making soap at this time, and that's when I heard about lotion bars. It was easy to get a hold of the three ingredients it took to make it, and within a week I had my first lotion bar… and the solution to my dry skin. That was December 2008, and two months later, I turned it into a little business. My first sales came from an online large family forum that I was a part of. My first customers became fast friends, even to this day. 6. How did you train for and learn what you needed to learn to do this business? No training at all. Zip. It was important that I not go into debt to start a business (Thank you, Dave Ramsey! ), and the local library put me onto people like Seth Godin. I felt like I knew absolutely nothing and I would ask a ton of questions from other businesswomen, like my hairdresser. Over the years, I've learned by listening to a lot of podcasts. Although I do read blogs and books, I prefer to get my information via podcasts because of its convenience of being able to listen while working on packaging, or exercising. 7. What did you need to start your business? I knew a bit of HTML from starting a little ministry site years ago. That has helped a lot with creating a website, figuring out how to make buttons for Paypal, and making simple ad graphics. Other than that, my equipment was simply crock pots and turkey basters. As the business grew, I've been able to invest in custom materials, extra refrigeration and bulk ingredients that now take over the garage. Just last night I purchased a commercial vacuum pack sealer that will cut our production time for one of our products in half. It was expensive, but taking into account how cumbersome our current process is, it will be well worth it. 8. What does a typical ‘work’ day look like for you? How do you balance your work hours with your homeschool hours? I'm discovering that I have to take the time to create good habits and so our mornings begin with my husband and me taking a walk to a local lake to pray. We're usually gone for a good hour and our kids are finishing breakfast and chores while we're away. When we return, they're well into their history lesson. With the growth of our business over the past two years, we're able to support the family with just the income from the business, so at this point, my husband directs 90% of the homeschooling and I jump in when needed. His creativity with the homeschooling has actually created an additional business start-up that he's recently launched, called 10KtoTalent. Meanwhile, my time is pretty much equally spent on the computer handling emails, setting up campaigns, and updating the website, or in the lotion workroom making products, or packaging the products and getting them ready to ship. We take breaks to prepare lunch and dinner, and we get a few more walks in for exercise. Of course, no project is ever uninterrupted… we're always fielding questions, checking schoolwork, reading stories to toddlers and tucking kids in at night. 9. Do your children help out in the operation of your business at all? If so, what do they do? My oldest son is able to do all the shipping once I have packages ready for him to ship. One son can print labels, another son will put stickers on newsletters, and anyone available will move boxes around, check on inventory in the garage, or carry packages to the van to take to the post office. They can't (or, I don't let them) do much with the actual product-creation, so much of the "help" they do involves the older children caring for the younger children, playing games, keeping them on task, and helping out with household chores. 10. What kinds of struggles or obstacles have you had to overcome in building your business? In the beginning, I felt like I didn't know enough to run a business. I didn't have any form of business degree and wasn't brought up to think in terms of owning my own business. We thought we had to hire the expert (and when we did that, it was an expensive failure). We actually thrived when we figured out how to do things ourselves and discovered we were part of a new wave of entrepreneurs that were breaking new ground. Other obstacles—We had to stop thinking local and go online. We had to narrow our niche and serve the person who truly had a dry skin problem versus the ones who were buying because it was a novelty item. We weren't sure exactly how the product should be presented, packaged and explained to get people to even try it, but we used online surveys to find out. 11. Were there any people in your life that were especially instrumental in helping your business to grow? Who were they and how did they help? My husband! Jonathan reminds me constantly of how amazing our products are, because they continue to help my skin all the time. He's a great sounding board for new ideas. We are the perfect pair to run a business because we bring different perspectives to every decision we make, and we're somehow able to balance the craziness of business life with raising eight kids. I have to say that it's difficult to find cheerleaders when running a business. Someday I want to be that cheerleader for other budding entreprenuers. We will definitely be that for our children, because it is so important to have support. 12. What are the advantages your business? There are a ton of advantages. Our kids will likely run their own businesses when they're old enough to because they see the "love letters" we get from customers, they see the control we have over our income, they will always know that their income can come from something they love to do, and not just a job they may not like. They are already coming up with their own business ideas, although they still need to be cultivated. We love the flexibility of our schedule—all summer long we were able to take the neighbor kids down to the lake to swim because my husband could do that at 3 p.m. while I worked on the business at the house. 13. What are the disadvantages of your business? We aren't yet able to leave the house for a week to vacation somewhere. We'd need to figure out how to ship orders if we did that. There can be a lot of risk with where to spend marketing dollars (although that lessens over time as you figure out what works and doesn't work). 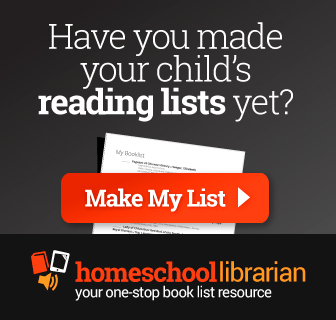 You have to accept that homeschooling might look different at busy times of the year. Finances can be a point of tension. Knowing you might be good at marketing but horrible at accounting is something you have to accept. 14. Looking back, if you could change something about how you got to this point in your business, what would it be? We could have wasted less time if we had targeted our market faster. If I were to identify my number one customer, she is likely a mom, like me, with dry skin, especially on her hands and feet. I wasted time trying to appeal to the woman who wanted her lotion to smell like lavender, or to get the electrician with the horrible man-hands to buy. 1.) My product would never serve the "Bath and Body Works" crowd, and 2.) it would be the electrician's wife, not the electrician, who would buy hard lotion. Overall, I feel like we learned SO much, even through our mistakes, but thankfully our mistakes were small because we tested and listened to our surveys, and when it came to marketing, we stopped advertising in venues (some bloggers, GoogleAds, and Facebook promotions) that didn't deliver. 15. What are your future goals in relation to your business? I would love to network with other momprenuers to compare ideas. I'd prefer to keep the business growing but also start new businesses rather than try to expand this one at all costs. I'm especially looking forward to helping my husband with his new www.10ktotalent.com business. 16. How could other homeschool families help support your business? The best way to support my business is to let me know what blogs you enjoy reading. I need to know where moms are online. That is where I go to advertise my products. 17. Do you run an affiliate program for your business? 18. Anything else you’d like to add? Usually everyone has something unique in their life—a skill, interest or talent that they can share to improve the lives of others. Don't think in terms of a traditional career label to do from home, but think of a way to sell your product or service online to resolve a specific need. Try to think outside the box with a product or service you sell. When I was given the opportunity to sell at a local farmer's market, I considered selling bread because I was beginning to get good at it. I'm very glad now that I didn't, because I would have competed against a large breadbaker who offered a huge selection of breads and muffins at the market. If you're good a photography, don't just be a wedding photographer, but hit up small businesses to take photos of the businessperson in front of his or her business and create a Facebook timeline image. There are plenty of niches popping up, and by getting creative, you could become the go-to person in a very specific field. Lastly, think like a mom, not like a marketer. It's the moms who buy, and when you see a product that you think should be presented differently, you're probably right. The used car salesman line is gone – today's businesses have to be generous, relational, crowd-building and honest. For most moms, that should come naturally. Present your wares or services in such a way that you'd personally be enticed to buy. If you homeschool and run a home business—whether it's Mom making money from home or the whole family participating in a business venture—and you'd like to participate in this series of interviews, please send me an email. The Homophone List That Has Taken Over Two Decades To Compile! Thank you for this series! I'm a SAHM-HS'ing mom… and I've beem trying to think of ways to supplement our income (perhaps with it becoming the family biz in time! )… but just don't know where to start. I look forward to reading the rest of your series! I just started my own business last year and I could definitely use some ideas on running a business from home and online while homeschooling. Thank you! Would you be interested in being interviewed for the series? Even if you're just starting out, I'm sure you've learning a lot in the journey that could be an encouragement to others. Thank you for this post! I loved reading Renee's insight. We are a homeschooling family with our own home business as well. It's definitely challenging, but rewarding! I really enjoy hearing from Renee, I ran across her by accident and love the products. This had been life changing for me and my family. I too sell at farmers market and enjoy helping others with skin conditions. Thanks Renee for all your help. Thanks for selecting Renee I will look forward to your next interview. Very interesting article. I am a stay at home mother, homeschooling 6 children. My husband is self employed (plumbing contractor) and I help him with his paperwork, answer all the calls and take care of the job scheduling. I thought it was funny to read about the Harris' farmers market experience as that is exactly what we did this summer – homemade goats milk soap, comfrey salves, wood work, artisan bread and other baked goods. I think it would be fun to participate in this interview but we are still so new our business…Mosquito Creek Farm is just getting started! I look forward to reading about how others like us are managing and juggling their days! @Michele @ Frugal Granola, Are you interested in doing an interview for the series? remove people from that service? Cheers! Can you forward me one of those emails? I've not heard of this happening before and I'm not sure how to unsub on my end. How Much Money Do Families Spend on Food?